Like millions of other people, I freaked out a little last week when I learned that my personal information "may have been impacted" by the Equifax breach. Thieves got the mother lode of data, which they could use to open credit cards or loans in my name. But what should I do to protect myself? I wasn't sure. Equifax said it was offering a free credit monitoring service, so I decided to start there. I tried to sign up for it right away on Friday, but instead I was given an enrollment date to come back: September 13. I would have to wait almost a week to get it. In the meantime, I pulled one of my credit reports to see if anyone had tried to open an account in my name. So far, so good. I also placed what's called a fraud alert on my credit reports. Basically, it tells businesses that I might have been a victim of fraud -- and that they should take extra precaution before opening an account in my name. It took me just a few minutes to fill out an online form to put the alert in place. The service is free from any of the three credit agencies -- Equifax, Experian or TransUnion -- and lasts 30 days. After talking to experts, I decided that I should put a freeze on my credit reports as well. It blocks businesses from accessing my report, as long as I don't already have an account with them. "The only way to prevent new account identity theft is through a freeze," said Mike Litt, consumer program advocate with U.S. Public Interest Research Group. The drawback is that it could get annoying when I want to open a new account myself, requiring me to contact the credit agency to temporarily lift the freeze -- and it could cost a small fee depending on your state. In New Jersey, where I live, it costs $5. But I'm not planning on opening a new loan or credit card anytime soon. I think the extra protection is worth the effort and potential hassle. 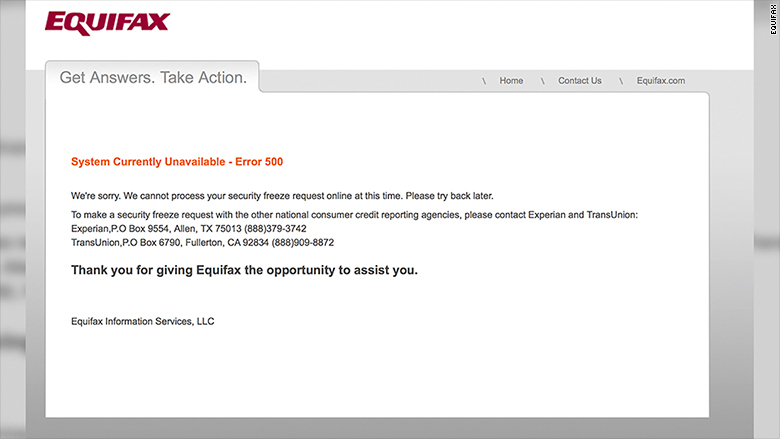 On Wednesday, I returned to the Equifax website to freeze my credit and finally sign up for the monitoring. But I was unsuccessful on both counts. Related: What's a credit freeze and should you do it? To put the freeze in place, I had to submit my name, date of birth, Social Security number, and address in an online form. But then I got this message: "We're sorry. We cannot process your security freeze request online at this time. Please try back later." There was no explanation, and no number to call. Instead, the message provided contact information for the two other credit rating agencies -- Transunion and Experian. This is the message I got when I tried to freeze my Experian credit report on Wednesday... and Thursday. The thing is, I need to put a freeze in place at all three, including Equifax. So then I called the Equifax hotline to see if I could put set up a freeze over the phone. An automated voice told me that all lines were busy and I was disconnected. That happened twice. Later on Wednesday, the company issued a statement that said it was experiencing a high volume of freeze requests and that the system was offline for about an hour to address technical difficulties. But when I tried again on Thursday, I received the same online message. A monitoring service might not be necessary if I already have a freeze on my report. Typically, these services alert you if someone has opened an unauthorized account in your name, but only after the fact. But it would be helpful to have in place for the time being. And Equifax has made one year free for anyone who signs up before November 21. The TrustedID Premier service does go a step further. It acts like a less-strict version of a freeze on my Equifax credit report. It would still allow access to creditors who want to make me a pre-approved offer, as well as potential employers. Those third parties are blocked if you have a real freeze in place. The service also provides up to $1 million in identity theft insurance and scans the Internet for suspicious use of my Social Security number. This could alert me if cybercriminals are selling my Social Security number online. Other companies, including Experian and TransUnion, offer monitoring services and identity theft protection for a cost that usually ranges from $9.99 to $29.99 a month. But that's as far as I got. 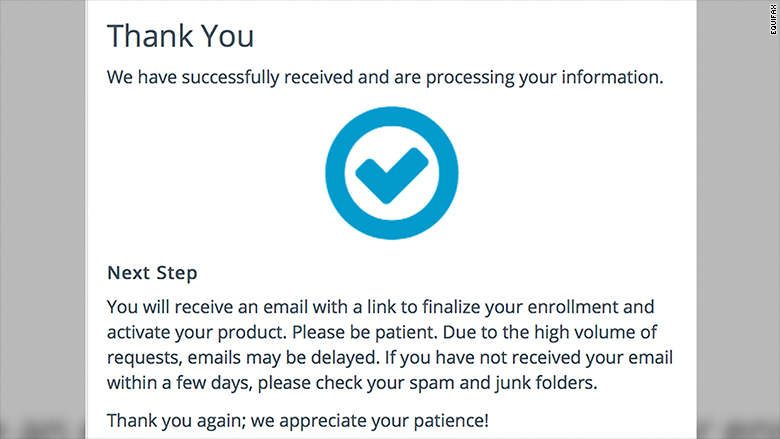 I was told that I would receive an email within a few days with a link to finalize my enrollment. I wanted to enroll in the free monitoring service on Wednesday, but this was as far as I got. What's left? I contacted the other two credit rating agencies to see if it would be any easier to freeze my credit with them. I made more progress, but still fell short of success. At Experian's website, I supplied (yup, you guessed it) my name, address, date of birth, Social Security number, and email address. And again I was told I could not complete this process. A message said that I would have to send a bunch of documents to them via snail mail in order to request a freeze. I'll have to gather a copy of my driver's license and a copy of a utility bill or bank statement before sending that package of personal information off to the company. TransUnion said it could not confirm my identity after typing in my personal information. But it did give me a phone number to call. An automated messaging system had me type in some information via the keypad: Social Security number, date of birth, and address. This time, I was told that the freeze was put in place! This was the closest I got to a win all day... but I still have to wait five to 10 business days to receive confirmation in the mail. I'll believe it when I see it.